This son of Ramses III died too young to pass into the divine presence of the gods of the underworld unaccompanied. The scenes show Ramses III leading the nine-year-old youth and introducing him to the various deities. The boy wears a side-lock of hair, indicating youth, and carries the feather of Truth, as he obediently follows his father. 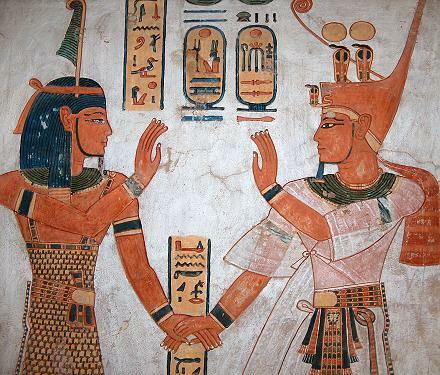 On the left-hand wall of the tomb chamber, travelling clockwise, we see Ramses III, followed by the young prince, offering incense to Ptah (a) and then introducing his son to him. Ramses then presents the boy to Duamutef and to Imseti (b), who conducts the pair to Isis. Note that Isis (c) looks over her shoulder to the advancing pharaoh. She holds him by the hand. On the right-hand wall Ramses and his son are conducted to Hathor (d), Hapi, Qebsennuef (e), Shu (f) and Nephthys (g), who puts her hand beneath the chin of the bereaved Ramses. 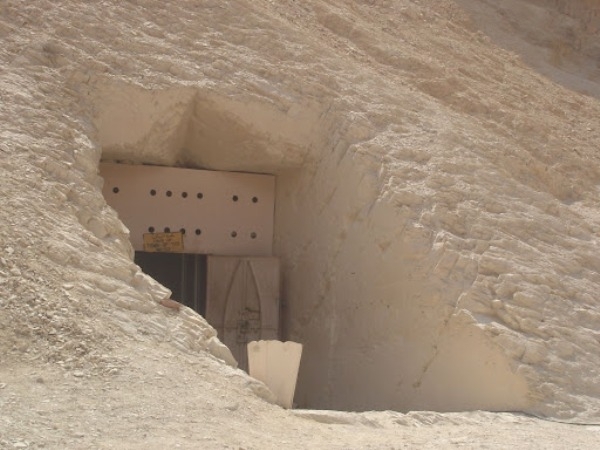 There was no mummy of the boy in the sarcophagus but instead the foetus of a six-month-old child. It is suggested that the Queen was so upset by the death of her son, that she miscarried this baby.